Healthy teeth and gums are essential for all pets, from chewing and eating to grooming, defense and clean breath. With just a few steps, pet owners can keep their pet´s mouth healthy and avoid a range of unpleasant and dangerous health issues that result from poor dental care. • Loose or missing teeth If any of these signs are noticed, it is best to take your pet to the Paw Depot to speak to a pet expert about hygiene or teeth cleaning options. Good Dental Care The best way to avoid dental problems is to establish a healthy mouth regimen for your cat or dog. 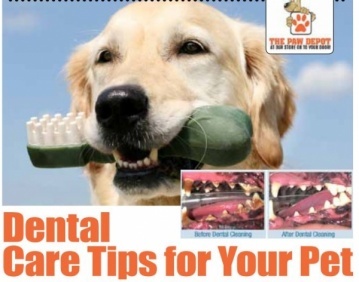 • Clean your pet´s teeth regularly with an appropriate pet toothbrush and toothpaste; human-sized tools and human toothpaste are not suitable and can be dangerous. Ideally, aim for cleaning a pet´s teeth 2-3 times per week. • Schedule annual dental checkups with our Paw Depot Grooming experts to remove tartar buildup and look for more serious issues. At Paw Depot our master groomers are certified pet hygienists and we DO NOT use any anesthesia during teeth cleaning procedures. This is very important for small breeds, older pets or any animal with allergy sensitivities, as complications from anesthesia can lead to serious health issues including seizures, coma and even death. • Include dry, crunchy food in your pet´s diet. Hard foods help scrape away soft tartar before it can harden, and leave less debris in your pet´s mouth that can cause further tooth decay. • Offer your dog treats (made in the USA) such as Bully sticks, Moo tubes, Bones, Turkey necks, Water buffalo horns, Antlers and Brushless tarter control treats. Paw Depot has a whole section dedicated to safe and effective Oral Hygiene that dogs love and enjoy. • Offer suitable chew toys to satisfy your pet´s gnawing instincts and help scrape away tartar and food debris before it can cause more severe dental problems. Chewing also helps massage your pet´s gums and strengthen teeth to prevent further decay. With proper care, cats and dogs can enjoy healthy teeth for life, and pet owners can easily minimize the risk of tooth and gum problems that can lead to greater health issues, discomfort for their pets and expensive vet bills. Seed Food & Wine Week It’s Fitness Party Time!